Need some assistance to remain focused on your spiritual path? Read about our handmade Phosphosiderite healing crystal bracelet below to see if you connect with this crystal. Helps to overcome fear, relieve stress & calm a quick temper. Has a strong resonance with the heart chakra, therefore helps to nurture oneself, receiving the energy of Divine love knowing that you always have the support of the Universe. Helps one to remain focused on their spiritual path in this lifetime. Phosphosiderite is said to be a rare stone. The meaning of this stone's name is related to its mineral makeup, as it contains both phosphorous and iron. Siderite relates to the Greek word sideros, meaning iron. It is said to also be known as 'piedra voga' meaning pink stone and 'la rosa voca' meaning pink rock. Most of these crystals are mined from areas of Chile, Argentina, Germany, Portugal or the USA. You will notice yellow veins within the stone. These may be very fine lines or heavier lines and some of these stones even have yellow patches in them. It is said that the yellow inclusions are called Cacoxenite. This healing crystal is very powerful in assisting you to feel calm and has a strong resonance with the heart chakra, therefore helping to nurture oneself. This gemstone is helpful in overcoming fear, relieves stress and reduces anger, calming a quick temper. It can also be used on all of the 7 chakras for specific healing work in order to open, cleanse and purify each chakra. For example, if you use Phosphosiderite within the solar plexus chakra, it can help you to break emotional ties that bond you to others, specifically those that are not in your best interest. If used on the third eye chakra, it opens one's consciousness to the higher dimensions so that one is able to receive the energy of Divine love and to know that you always have the support of the Universe. This gemstone has a very calming, nurturing energy that helps one to remain focused on their spiritual path in this lifetime. So, if you are looking to raise your vibration and experience the calming energy of Phosphosiderite, this energy bracelet is for you! Phosphosideriete has been said to have excellent healing action in the body. Its action can easily be felt in the stomach area and it seems to work to support the thyroid and adrenal glands. If you have health issues related to aging, it can help negate these problems. 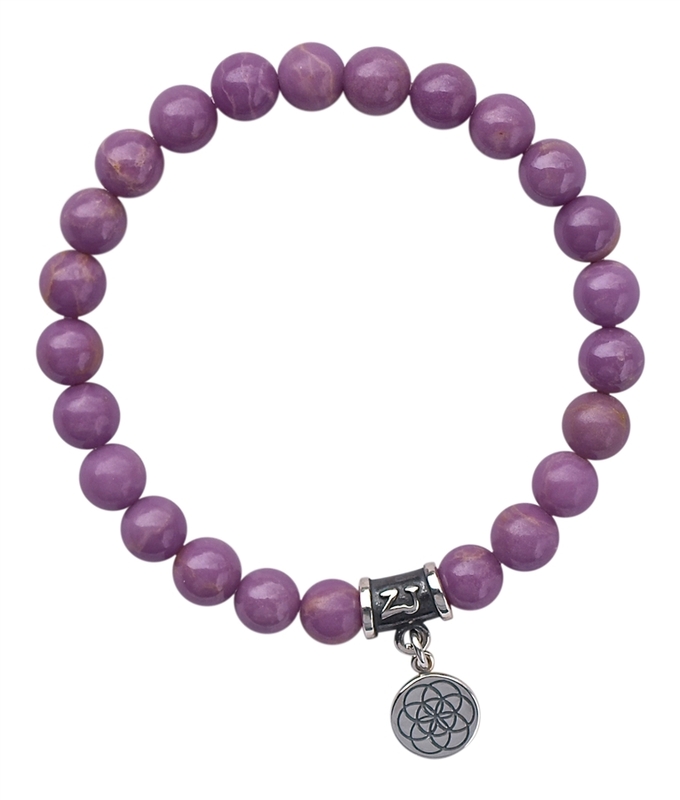 Wearing a Phosphosiderite bead bracelet may allow your cells to be reprogrammed and all of your cells to be regenerated. It can also aid issues that may be psychosomatic in nature. If you have heart related health concerns, you may benefit from this powerful gemstone because of its resonance with the heart chakra. It can also help issues with the lungs, such as respiratory problems like cold or flu.